I hope you enjoyed yesterdays post and found it informative... I am going to try this year to post information that I feel can be beneficial to both seamstress( beginner and novice) and women just wanting to better their sense of style . With this shape there is little difference between the bust, waist and hips. Your shoulders and hips are balanced but there is no defined curve to the waistline. Avoid horizontal lines near the waist. With the rectangle shape you should focus on drawing the eye away from the wait area. Long dresses, jackets and skirts draw the eye down and will compliment your figure. Try flared and peplum type skirts to help accentuate the hips ! This shape is usually equally balanced on both top and bottom . With this shape the choice of styles is almost unlimited. Wear clothing that shows off your narrow waist if you have one. Even tho you can get away with wearing just about nay style please be sure to keep it in proportion to your height and weight. You can experiment with different colors and prints. If you are aiming to appear taller try matte textures, small prints, monochromatic colors . I hope that you found this informative. 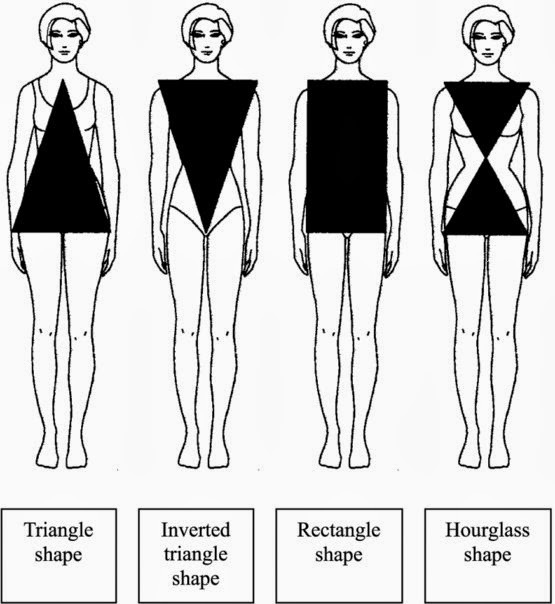 Read the diffrent body types carefully and decide which one is the closest to your body type. Please remember to be honest because you are oly hurting yourself if you pick the incorrect body type .